Excerpt: When I introduce the topic of substance examination and the study of samples to an audience of budding microscopists, I will try to persuade them that once particles are classified, they need not learn how to identify every possible example in that class until they first learn the types of particles that are encountered daily by the microscopist. The number is always far less and more manageable, and this usually puts them at ease — for a while. … It got me thinking that most microscopists will likely never see but a small fraction of any class of any substance no matter how long they live, and they are likely to view 10-20 of them repeatedly in a variety of contexts. So this begs the question: what are the Top 10 of every class of particles every microscopist should know? And, if we haven’t learned those 10 yet, we have some catching up to do. Abstract: In this study we compare the morphology and composition by polarized light microscopy (PLM), micro-Raman spectroscopy, and wavelength dispersive spectroscopy (WDS) using an electron microprobe of tailings samples from two former talc mines in the Gouverneur Mining District in New York State. The main purpose of this project was to better understand the alteration of amphiboles into talc within these samples. The interaction of these minerals along their grain boundaries is important due to the resulting asbestiform and acicular (i.e., non-asbestiform) morphologies of talc and anthophyllite within the rocks in this mining district. Intensity maps created from micro-Raman imaging highlight the different mineral phases present in the samples, while the electron microprobe precisely determines the weight percent oxides of the mineral phases, which aids in their identification. Backscattered electron (BSE) imaging with the microprobe was also used to compare differing mineral compositions with the Raman maps. The samples were prepared as polished thin sections for our analyses. Each mineral phase was discernable from each other through both analyses, however, changes in the talc and amphibole orientations created variable intensities in the Raman maps. The first sample is from the Arnold Pit near Fowler, NY within the mining district and is a talc schist with some tremolite and calcite. The talc occurs primarily as platy crystals and in some fine-grained masses. 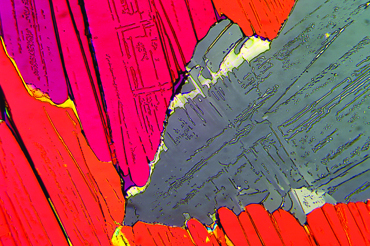 Compositional and morphological analyses of the minerals suggest the platy talc in this sample is an advanced alteration product of non-asbestiform anthophyllite. The fine-grained talc in this sample potentially formed from a separate hydrothermal event. The tremolite occurs as unaltered, blocky crystals. Some of the tremolite and calcite crystals are fractured without any visible alteration with fine-grained talc filling in the fractures. The second sample is from the Talcville mine near Talcville, NY and is a tremolite schist with some crystals of anthophyllite, talc, and phlogopite. The tremolite is long, acicular, and unaltered. Phlogopite occurs as plates in the sample. Anthophyllite grains are acicular and fractured perpendicular to the long axis of the grain. Talc occurs as an alteration product as fine-grained masses along the edges of anthophyllite grains and within the fractures of the anthophyllite. 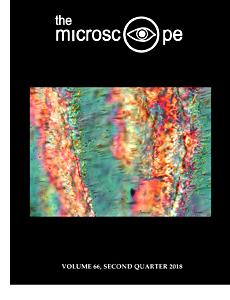 Abstract: The precise measurement of refractive indices (RIs) of transparent small particles in a liquid mount slide preparation (using classical light microscopy and polarized light microscopy techniques) requires exact knowledge of the slide preparation temperature, and that the necessary temperature coefficient calculation be performed for the liquid before reporting final measurement results. Commercially available RI standards for microscopy are supplied as liquids in bottles with the temperature coefficient printed on the label or available from the manufacturer. Previous proposals for temperature measurements in a microscope’s light path (as published in handbooks and online articles) may be misleading due to the large and thermally inert mass of the mercury-containing thermometer bulbs that are routinely used today. An experimental setup was devised and duly calibrated using a miniature negative temperature coefficient (NTC) thermistor as the temperature sensor and a high-resolution ohmmeter to observe temperature effects in a way that is much closer to reality than the older, obsolete procedures. The results for this particular setup show that only negligible thermal effects are observed in slide preparations containing three drops of immersion liquid. Extrapolation calculations for situations with less liquid show that, in such cases, the expected temperature effects are also small to negligible. Critical Focus | AI: Artificial, Yes. Intelligent, Not. Today’s digital automation and machine learning are wonderfully efficient, but they pale in comparison to the genuine intelligence and complicated mechanisms of the living cell. A thin-film fusion preparation of trioxane spontaneously cooled after melting between a slide and coverslip over an alcohol lamp. The interference colors are anomalous due to variation with wavelength of the refractive indices and thinness of the prep; crossed polars with a Red I compensator.